This was no big surprise for the final book of this trilogy, good defeating evil. One thing I was disappointed in was the way Willim dies in the end. For a wizard so powerful to die so easily is just not right. The final fight should have been dragged out at the end, it went too quickly. Also The scenes with Tor traveling to the mountain top are just silly and really are not needed in the story. This is the final book of a trilogy and the other two must be read before this one. This is part of the Dragonlance universe. In this one, the dwarfs that exist outside of Thobardin have united to free that realm from its tyrant.This was an exciting end to this trilogy. Each successive book was better than its predecessor and the whole trilogy was a good read. The author does a really nice job with all the different clans of dwarfs and bringing them altogether. I have written this before about Douglas Niles and it it true with this book. Douglas Niles does a fabulous job with battle scenes. In this book, we get huge battles between dwarfs, battles with dragons, and battles between mages and clerics. I loved every second of it as the author leads the reader into the ebbs and flows of the battles. I had a complaint about the first book that the characters were not standing out. By the end of this trilogy each character was easily defined and stood out.Overall I was impressed with this trilogy especially since it had a slow start. The action was top notch and I liked how the author accomplishes his goal of changing the landscape of the dwarven kingdom. Heldur klén lausn á ána fínni sögu, þónokkur Warhammer Fantasy fílingur í þessu dvergastríði, en það var fremur snubbótt þessi tilraun til að binda örlög allra þessara persóna saman undir lokin. 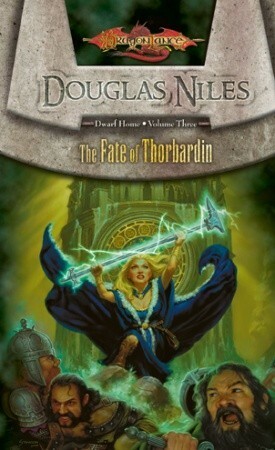 Douglas Niles - Douglas Niles is a fantasy author and game designer. Niles was one of the creators of the Dragonlance world and the author of the first three Forgotten Realms novels, and the Top Secret S/I espionage role-playing game. He currently resides in Delavan, Wisconsin with his wife, Christine, and two Bouviets, Reggie and Stella. He enjoys playing his guitar, cooking, and visiting with family.